John spotted this one at Pikes Peak. 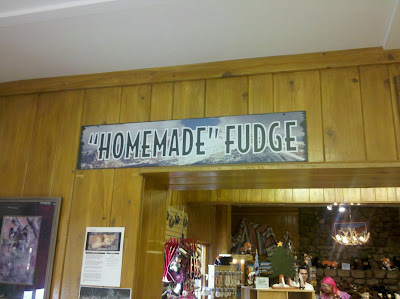 I guess the shop-owners home is too far away to regularly tote fudge in. Once again, I'm glad the quotes were around only the first word. This is fine, homemade is in quotes cause it's not literally made at their home. Shouldn't be posted on the site. When you start your own blog, you can decide what should or shouldn't be posted on it. I've always hated the use of "homemade" for retail businesses and restaurants, since most don't have anyone living there.